As I'm sure you know, I have a thing for the K9 breed. Read as: I'm obsessed with dogs; I want to own 15 dogs; I want to save every stray; puppies are my kryptonite. White dogs, black dogs, skinny dogs, fat dogs, tall dogs, small dogs, I love all dogs (no thats not an Eminem lyric, come on now). 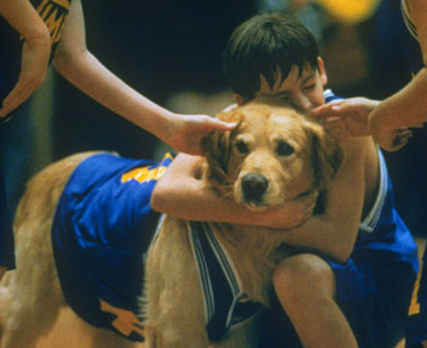 Naturally, back in 1997, Air Bud was my all-time favorite movie. It inspired me to beg (literally, BEG through dinner table prayers on a daily basis) to get my own golden retriever -- plus the main star was a total babe. After three years of this nonsense, my parents finally caved. We brought home Cassie, who is now old and white faced but still has a heart the size of Montana and can out-swim you any day. Such a dreamboat. Best. Movie. Ever. You can imagine my excitement when I learned that Air Bud would be screened outside at the Oklahoma Humane Society's Midnight Woofness Pajama Party this Saturday night...!!!!! Of course, any movie watching has to include some munchies, right? This event just so happens to include Roxy's Ice Cream, Taste of Soul Eggroll and Mutt's Hot Dogs food trucks - my favorites. In addition, there's a Midway with fun activities, giveaways, a DJ, an appearance from Rumble the Bison (Thunder UP! ), cute t-shirts (proceeds go to help local animals), and $25 pet adoptions! Its like all my favorite things all rolled up into one! They are even doing a local scavenger hunt leading up to the event (follow @OKHumane on Instagram to get the scoop!). You can bet your bottom dollar Chloe and I will be in attendance; Cassie would too, but she's in Kentucky...she sends her regards. Put on your PJs, grab your pooch and join us! The block party starts at 7 p.m. and goes until Midnight in front of the Oklahoma Humane Society Adoption Center on Western Avenue. More information can be found at www.midnightwoofness.org. There might even be a Midnight Bark (that's from 101 Dalmatians, if you didn't catch the reference).